Flipster makes it easy for you to read your favorite magazines on your computer or mobile device. 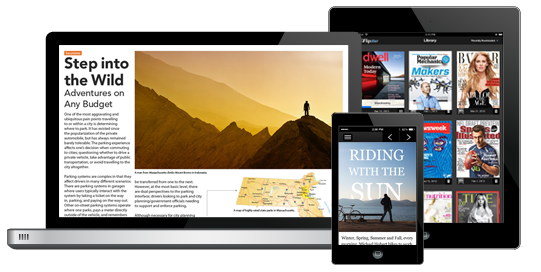 Access 50 different popular magazines and download them to read offline anytime, anywhere. A Flipster app is available for the iPhone or iPad to create a library of magazines downloaded from Flipster for offline reading. Download the Flipster app for iPhone or iPad in the iTunes store (iOS 8+ required), and then follow instructions below to download magazine issues to app. Play store (Android 4.2+ required), and then follow instructions below to download magazine issues to app. From the home screen of your device, go to Settings. Select Applications > Apps from Unknown Sources (allow installation of applications that are not from Appstore) and select ON. Flipster for Kindle Fire app. Once the download is complete, tap the file and select Install. Using your device's browser, access Flipster on the Libraries' website. Browse for the magazine you want and tap on it to open it in your browser. On the menu in the upper left corner, select 'Open in App.' The Flipster app opens and downloads the magazine. The NEW label appears in the lower left corner of the magazine cover when the issue is available to read. Tap the cover to open the magazine and the download will continue while you are reading. The mobile app is recommended, but not required. Using your mobile browser, you can also access Flipster and read magazines from your device with an internet connection. If you get to a screen that says "You must have cookies enabled to view digital editions," scroll to the bottom of that screen and look for the menu on the bottom, left. Click on the menu icon (it may take awhile for the menu options to load) and keep scrolling to the bottom of your screen to find the "open in App" option. Flipster is simple to use from your computer. Access Flipster on the Library's website, browse for the magazine you want and then click “Read This Issue” to view the magazine in your browser.